“Once upon a time there was a young woman who was more courageous than all the men in her mountain village”. What sounds like a fictitious story really happened. The young woman was Anna Stainer-Knittel, born as a gunsmith’s daughter in the Lech Valley in Tyrol on 28 July 1841. She proved her courage and independence of mind time and again in later life. For in her preparations for the novel, Wilhelmine von Hillern concerned herself not only with Anna Stainer-Knittel’s experiences, but also intensively with people’s lives in the mountains at that time. Her Geier-Wally also integrated motifs from Tyrolean legends. The material reached the opera stage via the publication of the novel as a serial in the Milan paper La Perseveranza. It was there that the Italian composer Alfredo Catalani became aware of it. He was able to obtain Luigi Illica as the librettist. 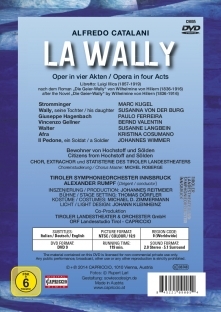 La Wally was first staged in La Scala in Milan on 20 January 1892 and met with a great deal of approval. 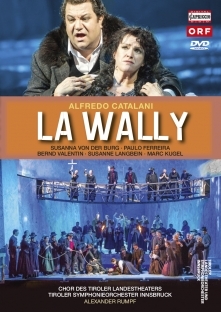 After the third performance, Catalani wrote to: ‘The house was wonderful and the prelude to Act II was repeated. At the end of the opera, I received general, long (and I must really say so) enthusiastic ovations. The impresario is very happy and says the opera will make its way through all the theatres’.